It's happened. I've become a morning person. Or at least the sort of babe that looks forward to the mornings. The soft light that fills our bedroom. The quiet before the world enlivens. The two of us making our way to the kitchen with soft throw blankets settled over our shoulders. Shuffling around in sock feet. Chatting and laughing and talking of dreams. Me at the range making something good to eat. Him at the Chemex brewer, fiddling with the coffee grinder. Holding each other as we wait for the coffee to percolate, the porridge to cook. We try to hit that sweet spot, where we get some time together before the day gets going. It’s been hard to leave bed lately. Leave that magic and sweetness in sleepy conversation while tucked under our comfortable duvet. I know that when my feet touch the floor my brain will want to begin the process of making. Breakfast, blog posts, recipes, emails, articles, yoga classes. The list goes on. Infinite creative accomplishments are possible in a day. And that hustle in my mind alights as soon as I turn upright. But before I get oriented to the fire of the day, there's coziness. Quiet steam lifting from my cup. Soft smiles shared over avocado toast. The sound of cardinals settling, curious, on the branches of our persimmon tree. Some of you may remember teff from my turmeric cashew butter chocolate chip cookies. Teff is a gluten free super grain, high in protein and calcium. It has a mild, nutty flavor. It pairs well with warming spices and chocolate. In savory dishes I like to use it like polenta. And it can sub 1:1 for buckwheat flour in baked goods. One of the more curious qualities of teff, both the flour and the grain, is how filling it is. I find it even acts as an appetite suppressant. A small serving of this Chai Teff Porridge keeps me full for most of the day until dinner. It's kind of a trip. In this teff porridge I whisk teff flour into a creamy spiced coconut milk base. You'll want to use the flour, as opposed to tiny whole teff grains. Using the flour gives the porridge a silky-smooth texture. The recipe takes no more than 5 minutes, all in all. Teff might even be the fastest cooking cereal grain. I mean, you can't beat 5 minutes for a stovetop hot cereal. I encourage you to play around with the toppings to your hearts content. Here I've used goji berries and hemp hearts. But cacao nibs, nuts & seeds, chopped dates, shredded coconut, etc. would also be great. It's up to you. You could also whisk a teaspoon of ground maca into the recipe for some extra energy and super powers! 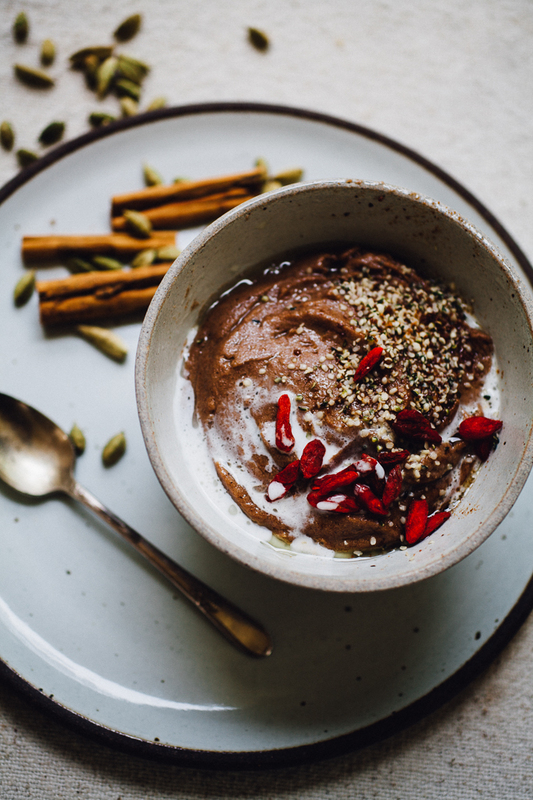 A 5-minute breakfast porridge made with teff flour and chai spices. In a small pot, combine the coconut milk / nut milk, coconut sugar, cinnamon, cardamom, allspice, clove, ginger, black pepper, and pinch of sea salt. Whisk everything together and add the teff flour a little bit at a time, whisking it into the milk as you go. Continue until you've whisked in all of the flour. Set the pot over medium low heat and — stirring constantly — cook for about 5 minutes, or until the mixture has thickened up and begins pulling away from the sides of the pot. Serve immediately with a drizzle of coconut milk, a sprinkling of coconut sugar and toppings as you like (I used goji berries and hemp hearts).